Lee Webb was a CFSC Program Assistant. Program Assistants are exposed to many aspects of CFSC work during their service. does outreach and communications work to educate and engage around the issues. As shown in the diagram above, this process is a loop in which each of the four types of activities uphold and mutually inform the others. The entire process results in both immediate and long-term changes towards a peaceful, sustainable world community. Experience in practical assistance activities identifies policy dialogue and research needs. Knowledge gained through research and experience is shared with Friends and the general public through education activities. Education activities also inspire more people to get involved, strengthening the concrete assistance and policy dialogue work. 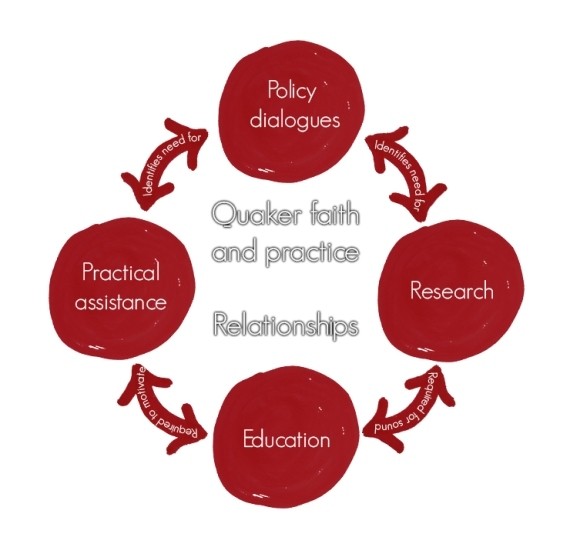 Underlying and absolutely fundamental to all of this work are Quaker faith and practice, central to how we work and why CFSC exists, and relationships with different types of actors, such as involved communities, other non-profit organizations, and governments. 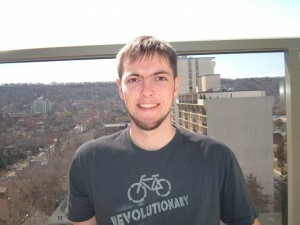 CYM appoints 15 Friends plus one Young Friend from across Canada to volunteer on CFSC. Each Friend serves in either a program or an administrative role. as well as a Nominating Clerk who helps find Friends to serve on CFSC. We also have associate members who don’t serve on CFSC but provide specific expertise on issues we work on. The board of directors is comprised of 9 people: the clerks of the three program committees, the Treasurer, the Nominating Clerk, the Personnel Clerk, the Recording Clerk, the CFSC Clerk and the Associate Clerk. The board is the ultimate legal and decision-making authority of CFSC. The program committees plan, implement, monitor, evaluate, and further develop their own program plans – the core work of CFSC. CFSC works on issues and manages projects that are of broad interest or concern to Quaker Meetings in Canada and/or Canadian Yearly Meeting. Meetings can raise a concern with CFSC and we will then consider how we might (1) support the Meeting to undertake the work, (2) take up the issue or project with the support of the Meeting, or (3) test the concern further with the Yearly Meeting. When an issue arises where CFSC wishes to find greater clarity on the public position and witness to be taken, we consult with Quaker Meetings and take the issue to Canadian Yearly Meeting’s annual sessions for discernment and decisions. Once there is a minuted decision, CFSC can develop a plan for the work, be that on its own, with Meetings, or with ecumenical or other partners.